Medford, OR. 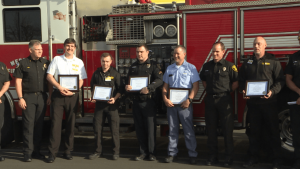 Fire-Rescue honored four distinct community members, as well as local business, Food 4 Less, on Thursday for their heroic and fast-acting efforts that saved two lives in December. The first incident, on December 22nd, began as a reported car crashing into the Food 4 Less building. Several employees and a customer moved quickly to check on the driver and realized she was not responsive or breathing. They called for help, turned off the car, and pulled her out to begin CPR. One of the employees ran inside the building to retrieve the closest AED. The first arriving Medford Police officer on-scene assisted with CPR until Medford Fire-Rescue firefighters arrived to relieve them. “We happened to be walking by going in shopping and just rendered care to her as we saw fit to what’s going on,” Cliff Maris, local United States Postal Service employee said. Maris has a history of valiant acts and medical training from his six years in the air force as a Medical Evacuation Specialist 452nd, who served during the first war in Iraq. Maris said helping and taking care of people are the two reasons that motivated him to join the military. “It’s just the training we had in the military that [tells us to] go to it and then take care of the problem instead of running away from it,” Maris said. “Due to the rapid and effective CPR performance, the patient arrived to the hospital with a pulse, and a chance,” said Melissa Cano, Emergency Manager for Medford Fire-Rescue. A week later on December 28th, a Food 4 Less employee was alerted of an unresponsive person, hunched over on a bench. The very same employee who assisted in the previous week’s incident again responded, and was instrumental in the life-saving efforts. They acted swiftly: calling for help, starting CPR, and even issuing a shock from the store AED before the first responders arrived.